The Ben and Dan Adventures will continue this summer, on PC and consoles, in a brand new game called Lair of the Clockwork God. 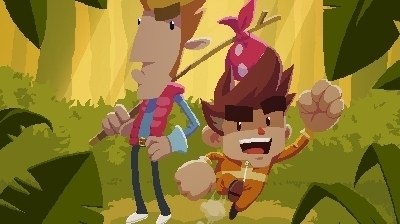 Ben and Dan Adventures refers to a series of games made by Size Five Games, which you might know better for The Swindle, a 2015 against-the-clock, side-on, stealthy actiony game about nicking dosh from safes. Christian Donlan reviewed The Swindle and really liked it. But before The Swindle, there was Time Gentleman, Please!, and before that, Ben There, Dan That!, and these are the Ben and Dan Adventures – Ben and Dan being the two characters who jovially squabble their way through the games. And they return in Clockwork God. This new game is a point-and-click adventure, then – sort of. The twist lies with Ben and Dan, because both like different kinds of games. Ben likes adventure games, the old LucasArts kind, and the way he interacts with the world reflects that – using objects and combining them to solve puzzles. Dan, on the other hand, likes platform games, and the way he interacts with the world reflects that – running and jumping and pushing blocks around. But the two of them will need to combine their genre-powers in order to overcome what lies ahead. “We all have fond memories of point-and-click games, but honestly who has the time for all that endless meandering anymore?” Size Five Games’ Dan Marshall said. It’s a concept understood more easily by watching the debut Lair of the Clockwork God trailer below. Incidentally, regarding Lair of the Clockwork God console platforms, Size Five Games is of course looking at Nintendo Switch as well as PlayStation 4 and Xbox One. It just doesn’t want to set them in confirmation stone in case something “winds up not happening”, Marshall told me. Oh, and if you like the look of Lair of the Clockwork God, there’s a Steam discount – 90 per cent off! – on Time Gentleman, Please! and Ben There, Dan That! for the next week.